Solid-state drive, or SSD for short, is a solid state storage device based on flash memory or DRAM. Compared with HDD, it is preponderant in start-up time and ability to access data. Even so, data loss from SSD remains inevitable due to mistaken deletion or formatting. Or it may become dead/corrupted because of virus attack and partition loss. So we should pay more attention to SSD data recovery and search an effective way to recover files from SSD. Recover as more files as possible. RePicvid Free Photo Recovery nicely conforms to the above requirements. Don’t be confused by the name. 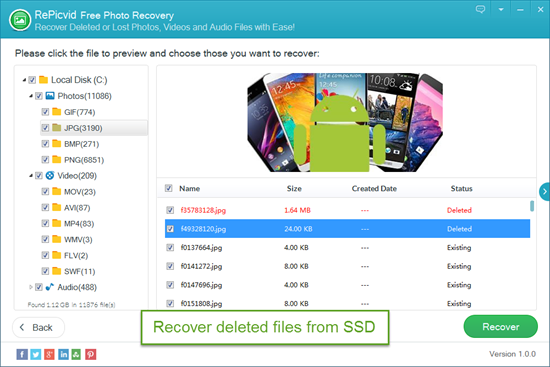 It not only supports photo recovery, but also recovers videos and audio files from internal/external SSD of Samsung, Intel, Kingston, Toshiba, Seagate, Sandisk, etc. Check the following steps to learn how to retrieve deleted files from SSD drive. 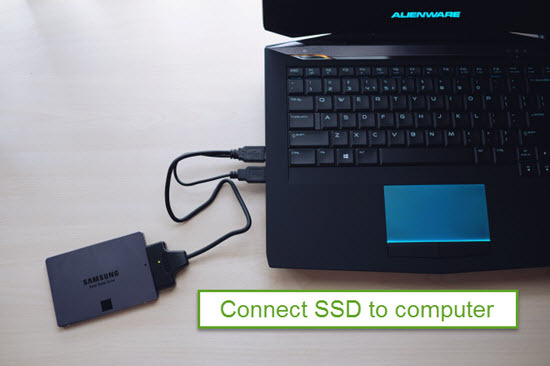 Connect SSD drive where you deleted files to computer with cables. Identify the data line and power line. Then run the software and choose All File Types. Select SSD drive and click Advanced Settings to pick format of files if necessary. Next, start scanning deleted files on SSD. 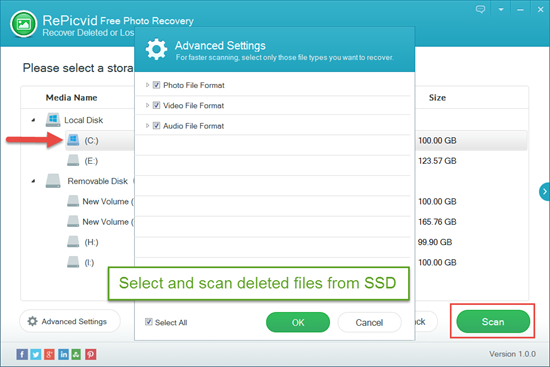 After that, preview all files on SSD and choose those deleted files you need to recover. Then save them to another drive. Think twice before deleting files in SSD or emptying recycle bin. Backup your vital data in HDD or other storage devices. Keep the power supply constant in case the electrical power fails.